Welcome to another edition of our weekly trivia challenge, in which we test your knowledge of all things fly fishing and where you might learn a thing or two about this sport we love. This week, we serve up a classic quiz with ten questions to give the ol’ gray matter a workout. Scores on the last quiz were quite good, but only one person scored 100%. Give it up for Austin, who claims that he’s never scored higher than 60% before. He must have stayed at a Holiday Inn Express the night before he took the challenge. There were a remarkable 13 people who missed a single question, and the most common score jumped to 60%. 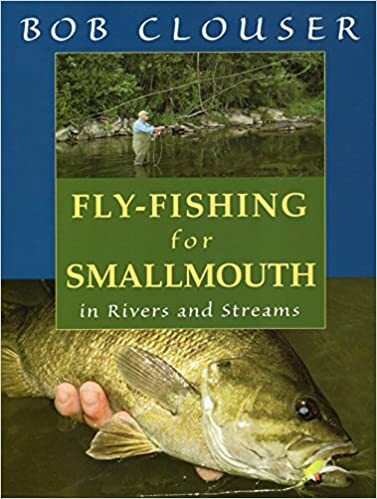 The winner of this week’s random drawing will receive a copy of Bob Clouser’s Fly-Fishing for Smallmouth: in Rivers and Streams, from Stackpole Books. The author shares the extensive knowledge he has developed over a quarter-century of guiding for smallmouth bass and serves up 32 of his favorite patterns. 50%. At .500 I am a first-ballot HOF candidate! 50% better than the last five weeks. 50% — more than I deserve. 50% So glad That I fish better than I test on these! 60% about usual for me. 70% Less than I thought I’d done. 50% and I’m ok with it. Cool book… Bob Clouser built my first fly rod! 30%. Sometime the blind squirrel finds nothing. Hewing to the mean – 50%. 70% — pleases with this score. 70%- The Bob Clouser Smallmouth Bass book would be a terrific addition to my fly fishing library. 70% – room for improvement. All I’m going to say is ouch. 90% Got the one I guessed on wrong. I think I may have won the Clouser book. If I did a great Christmas present. You scored 80%! It’s been a long drought of acceptable scores, is it over or is this an anomaly? 50% and glad to get it! right back to my 40% from 90% last week. And, isn’t the adriatic trout a salmon? 70% Hooorah!! Life is good!!! 30%. Go easy on me I just started fly fishing less then a year ago. 100% which is a shock! Wow! 70% is not bad when you only know the answers to seven questions. 40% and I knew the answer to 3. No lottery for me. A half full cup of water! Lordy Lordy look who got 40%! I’m not as smart as last week! 90% … with more than one guess.